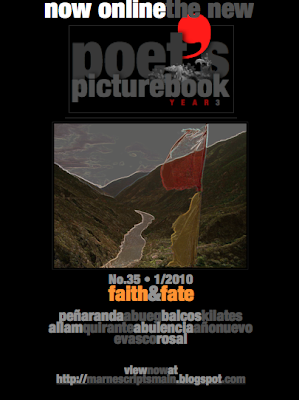 Faith & Fate, poet'sPicturebook No. 35, the first of Year Three, is now online. New poets and new poetry. Check out the new and continually intriguing little online magazine, poet'sPicturebook, owned and edited by poet & translator, Marne L. Kilates. Just click the "enter" button below.